After planning, prepping, and tending to your Farmhouse Garden, it’s time to stop and smell the roses. 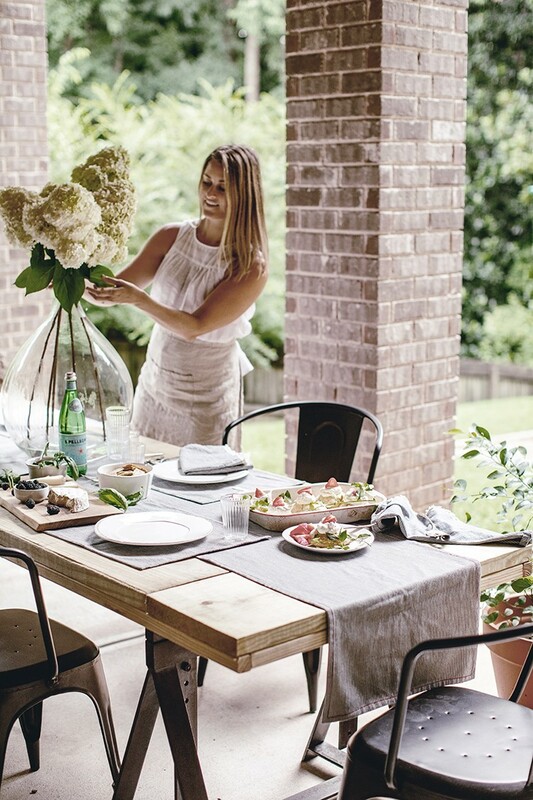 Ashley of Heirloomed believes your garden should be designed to enjoy, so today she’s sharing her favorite tips for garden-inspired entertaining. Just getting started? Click here to view the rest of her series! The last in our six-part series of creating your own Farmhouse Garden is here, and I’ve saved the best for last. It’s Ashley from Heirloomed and the whole concept for this garden-to-home project this season was inspired by being able to effortlessly entertain and host right from the comforts of your very own garden bed. 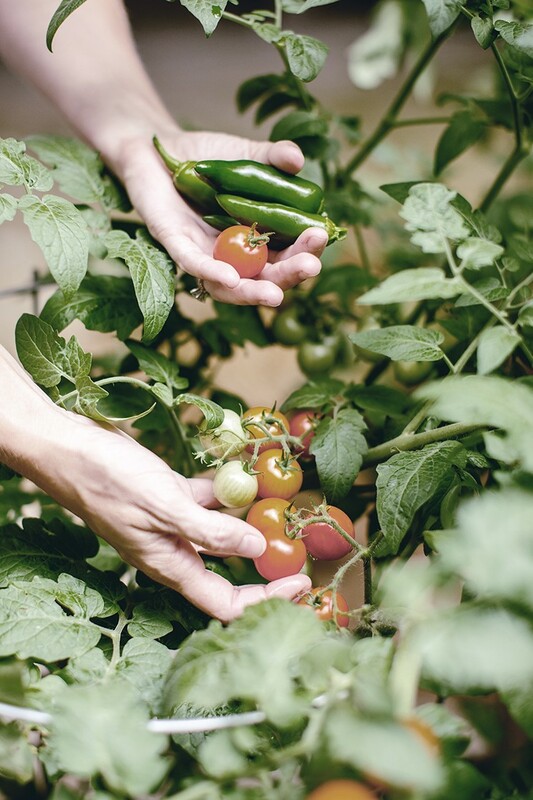 From the inspiration to the preparation, planning and creating our garden space, tending to it and finally reaping the benefits of the harvest it’s that special time of year that I savor every moment of. Today I’m sharing a few ways we love to entertain straight from our own Farmhouse Garden in hopes of inspiring you to do the same. This time of year when your garden is going crazy and at its absolute peak, it really is a rush to try to use it all up to it’s fullest potential. Right now my cherry tomatoes are going crazy and our herbs are literally bursting at the seams so I’m scouring all my recipe books and Pinterest to get fresh new ideas of things to make with my bounty. 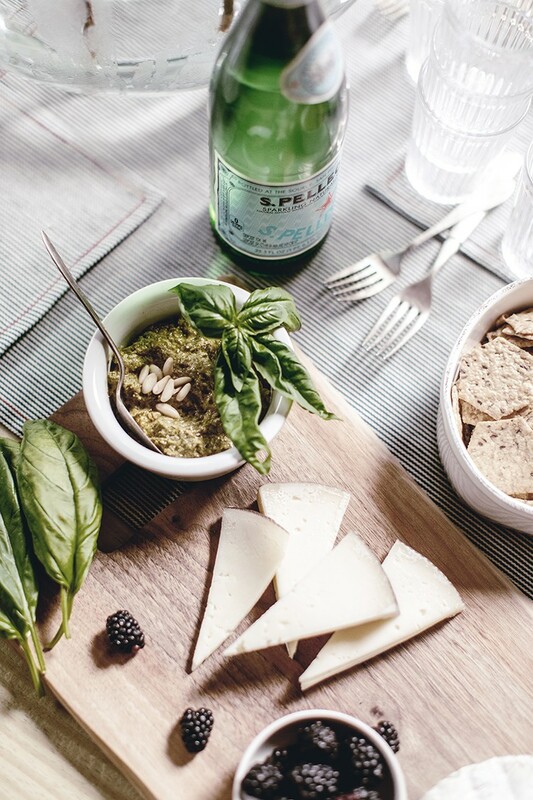 In my last post I shared an easy + fresh recipe for Basil Pesto but there are so many ways you can incorporate your herbs, fruits + vegetables into seasonal fare. And, if you really just can’t keep up and hate to waste anything you can always deliver care packages to your neighbors or use preserving techniques like canning jams and sauces. Staying on top of your picking will also help your plants to produce a maximum yield. 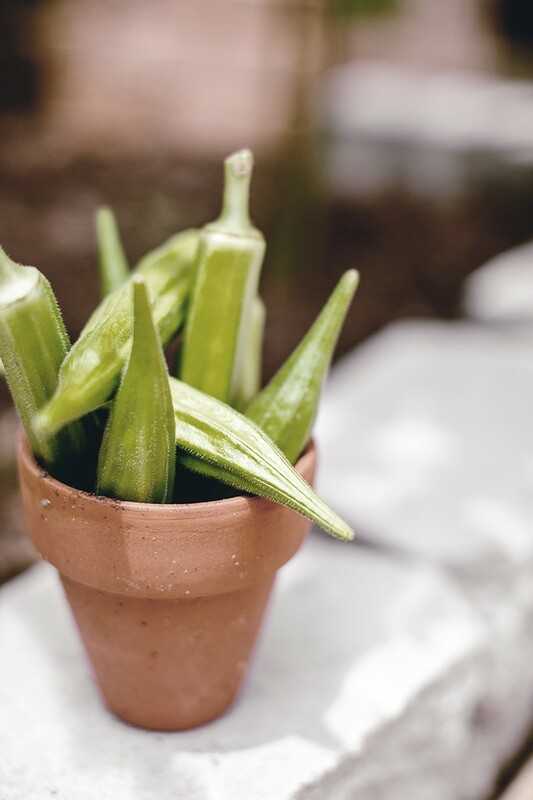 Remember to keep your herbs pruned of flowers before they go bitter, and that (carefully) cutting your okra before it gets too large will keep it tender and not woody and ensure it continues to produce more and more throughout the season. And of course, picking before the critters get to my tomatoes, cucumbers and blueberries is always a top priority. We work so hard on our gardens that sometimes I think we forget to literally stop and smell the roses. When your garden is at its freshest is the perfect time to sit back and enjoy the fruits of your labor. We set up a simple but beautiful little patio area right next to our Farmhouse Garden this year that is just perfect for hosting a crowd. 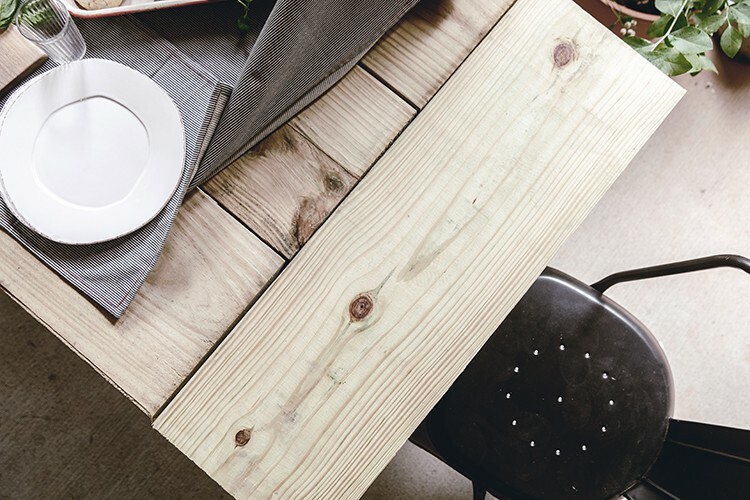 And my handy husband even built this large table for our space (you can click here for the easy Farmhouse Table DIY to make one of your very own) using simple pieces of lumber right there at The Home Depot and affixed it to some vintage sawhorse table bases we sourced at a local antiques market. Having something simple that can be outdoors for effortless entertaining of a crowd makes it a no-brainer when you’re ready to host. Everything is in bloom and so fresh and lush. 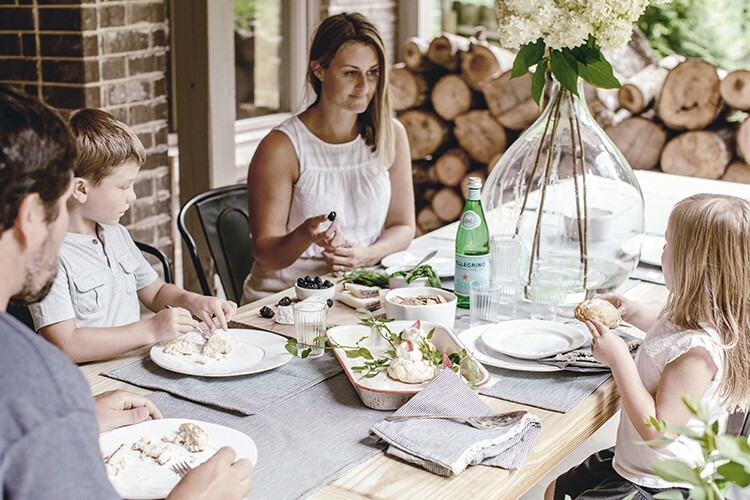 The sweet smell of the fruits and flowers makes for a perfect aroma, and it’s pretty impressive to have a spread on the table for your guests to enjoy with the plants they grew from within eye sight. There’s nothing that is more fitting for the season than to be able to pick a sprig of herbs and add it to the table at a moments notice. 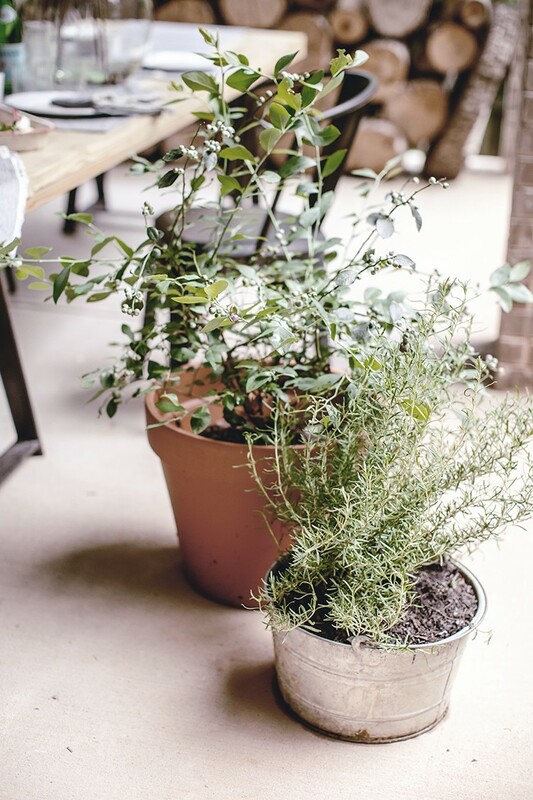 Now that they’re in full bloom I also love pulling in potted plants from my garden area to surround our dining and patio area, as well as to move around and fill in bare spots in the garden where some plants have come and gone throughout the season. 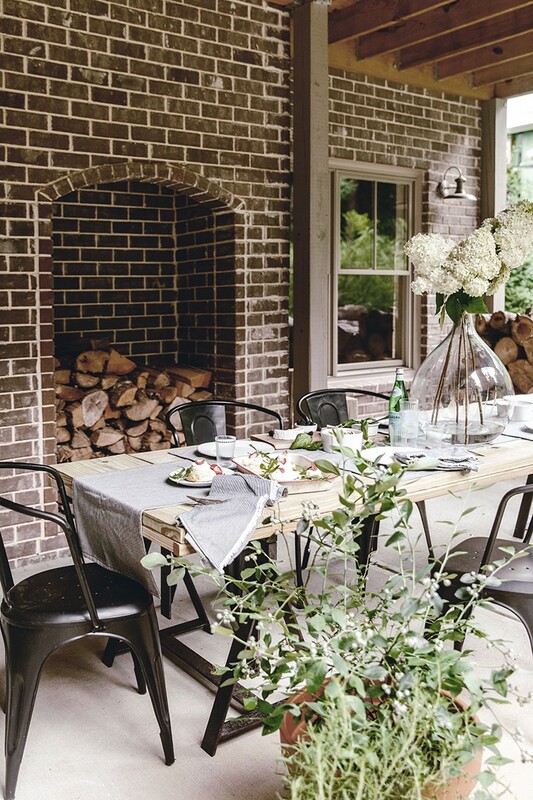 Mixing mediums with our pots, like this mix of simple terracotta and galvanized metal will give you the perfect farmhouse, cottage look that only gets better and better as they patina with exposure to the elements. While I am so proud of all our season ingredients for cooking, let’s not forget other ways in which we can entertain from the garden. I love mixing in fresh flowers from our garden with fresh cuttings of fragrant herbs. Rosemary with hydrangeas is a beautiful, rustic mix and wandering Mint with white daisies, echinacea and tickseed makes for the perfect farmhouse floral arrangement that feels like you just wandered through a field of wild flowers. Get creative, especially when you have mass quantities of things. A huge bundle of lavender or a bowl filled with a whole pile of fresh okra can make for a nice centerpiece on your table or kitchen island. 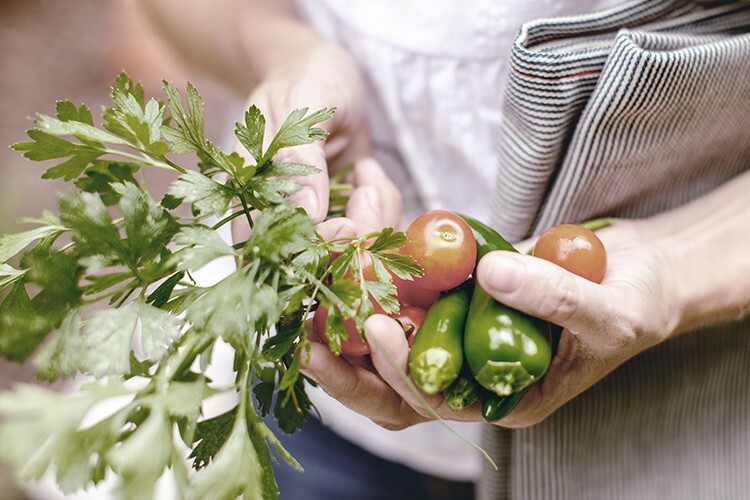 I hope you’ve enjoyed your garden this season and that you’ve found so many wonderful ways to care for, harvest and enjoy having so many fresh ingredients at your fingertips. I’m not sure who loved our garden more this year, me or the kids. Just remember to have fun with it and get creative, you’ll get better year after year and carrying on the artful craft of gardening for another generation is a gift that keeps on giving. Create a fresh farmhouse garden of your own with the help of Home Depot. Join the Home Depot’s Garden Club for ideas, inspiration, and tips for starting your own garden. The post Entertaining Ideas From Your Farmhouse Garden appeared first on The Home Depot Blog.